This happy and relaxing home is a spacious 2-story for travel/work. Enjoy! Beautiful, large home nestled between city life in San Francisco & scenic Napa Valley Vineyards. This happy and relaxing home in Rodeo, CA is a spacious 2-story for travel/work. Enjoy private access to full-size living room, fully-equipped kitchen, dining area, 2 bathrooms, 3 bedrooms, 1 home office, and washer and dryer. Home is a duplex/in-law, with downstairs neighbors, but completely private space. 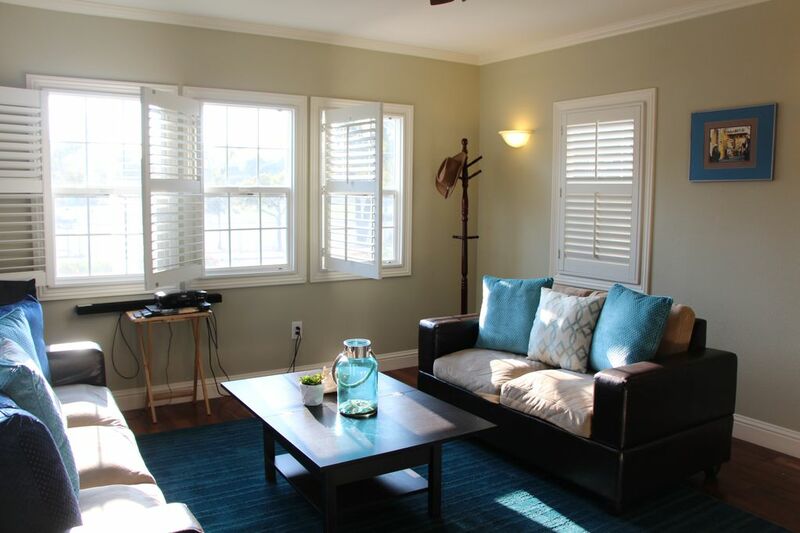 Near waterfront, hiking trails, and nightlife in Berkeley/Oakland. We are centrally located to many Bay Area attractions and destinations: Just half an hour's drive to San Francisco; about a 20 minute drive to Berkeley, and Solano Avenue restaurants; 25 minutes from Oakland's Jack London Square and the new Uptown District; half an hour to Sausalito and Muir Woods; 15 minutes to Six Flags theme park in Vallejo; about 25 miles to downtown Napa and the wine country. Nearby public transportation takes you to BART, and from Monday through Friday, there is non-stop LYNX bus service to downtown San Francisco. Pharmacy, shops and all manner of restaurants are all just over a mile away. For groceries, walk to the Safeway supermarket, about a block down the street. The nearest BART station is EL CERRITO DEL NORTE, approximately 10 miles from home. There is also the LYNX Bus Service provided by WESTCAT located at the Transit Center in Hercules, approximately 1.5 miles from home. It's an express bus directly to San Francisco. The cost is $5.00 each way. It will cost $3.00 for the entire day to park your vehicle at the Transit Center. A few condiments, spices, and condiments are provided for your cooking pleasure!